TED talks are not research presentations. They’re stories about ideas. They’re not rigorous. Why did I do one? Because the Open TV project asserts stories can inform. Open TV is a research project, where questions – how does queer TV develop? – inspire our methods – releasing of artistic and artist-centered pilots and series. In this talk I gave at TEDxNorthwestern last month I sought to tell a visual story of how to show more diversity within stories by and about people of color. So it was weird when I saw the final cut of the talk on YouTube. 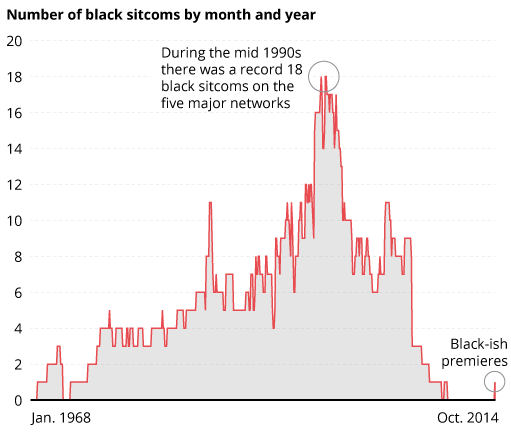 The editors only used one of the dozens of images in my presentation: this graph of black-cast sitcoms from 1968-2014. My one graph?! Frankly I was a little mad. I understand TED has a history of pop social science, where presenters use quantitative data to illustrate seemingly unquantifiable phenomena, or translate quantitative knowledge into simpler stories. But a big part of Open TV is interrogating the value of quantitative data. While we have access to viewcounts and hit counts, Open TV questions whether written and spoken responses to and expressions of art and stories are just as useful as data in understanding cultural phenomenon. This is a study of the distribution of art and television, why would you not show any images of artists or TV shows?! The organizers coached me well on the formula for the TED talk and gave me advice to make my argument clearer. The formula is real and unfortunately is not kind to nuance. For instance, there’s so much to say about the artists we’re working with. Each has an idiosyncratic and impressive creative trajectory, which I implore you explore on our site. There’s even more to say about diversity in television, which is not quite as simple as I made it seem. Corporate broadcast, cable and web TV networks showcase a lot of different characters, it’s clear. Yet so many seem undifferentiated, cast “colorblind” to appeal to mass audiences. We’ll get to it on this site! There will be essays and series presenting arguments about representation, in different and hopefully entertaining ways. My talk was 8 pages, single-spaced. I’ve never had to memorize so much in my life. It was one of the hardest things I’ve ever had to do. I made mistakes, as you’ll plainly see, but I hope the talk was coherent. You’ll see in the YouTube playlist the other presentations from that day were particularly flawless. Congrats to all! So it’s with an understanding of my own flaws I must regrettably call out the producers of the event for making a mistake in my presentation! One of my last slides on the research outcomes was deleted. I was thrown and mention that in the YouTube version (I edited it out for Open TV). Not every television story has to be 30 or 60 minutes, 13 to 20 episodes, featuring 50 characters and hyper-realistic CGI dragons. Open TV’s flexible distribution model, where we release series and show in a variety of (mostly short) lengths, is indie artist-friendly. I hypothesize TV stories can be more diverse if its strategies for production and distribution are as well. With that, here is the talk!